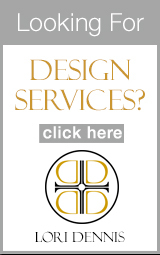 As with any design project, you want to figure out a realistic budget with a little bit of contingency. Is this going to be a quick freshening up or a major overhaul? If you’re just looking for to slap on a fresh coat of paint and replace some cabinet pulls, or refinish existing surfaces, you can realistically spend between $200-$2500. 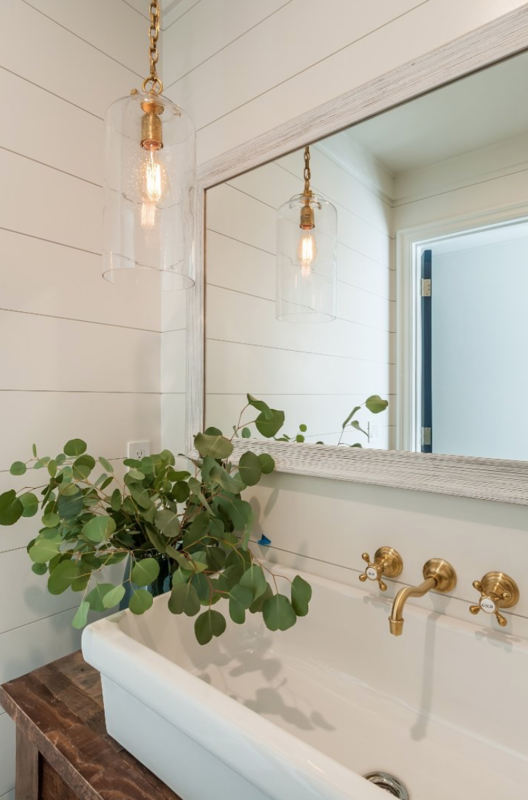 New light fixtures or appliances, window treatments, and new hardware will obviously increase your budget, but dependent upon the quality of materials and labor you need, you can still try to keep it under $10,000. Whereas, if you want new appliances, tile, lighting–the whole shebang; if you’re planning on adding skylights or moving appliances, rewiring electrical and plumbing (which would require opening up walls), you’re looking to spend upwards of $15,000. We like to think of remodeling a bath the way you would purchase a car, since people generally have more experience in car purchases than in renovations – what kind of car do you want? An economy, luxury, or premium vehicle, and on what features is there room for compromise in either direction? 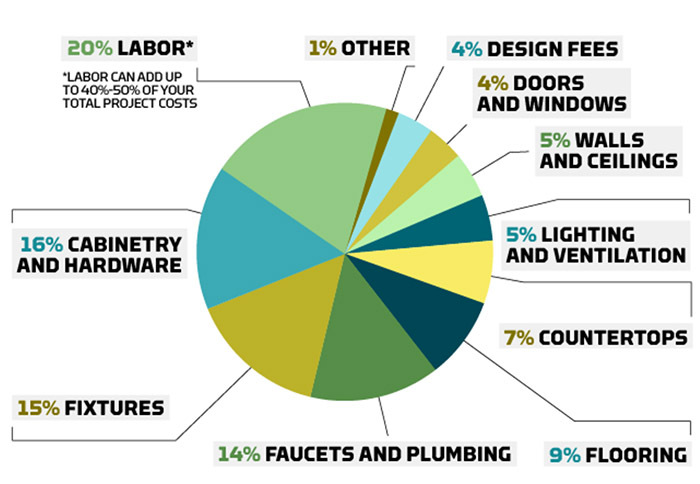 This chart from the National Kitchen and Bath Association (NKBA) provides recommendations for how you can expect to budget your bath remodel. Measure, measure, and measure again. 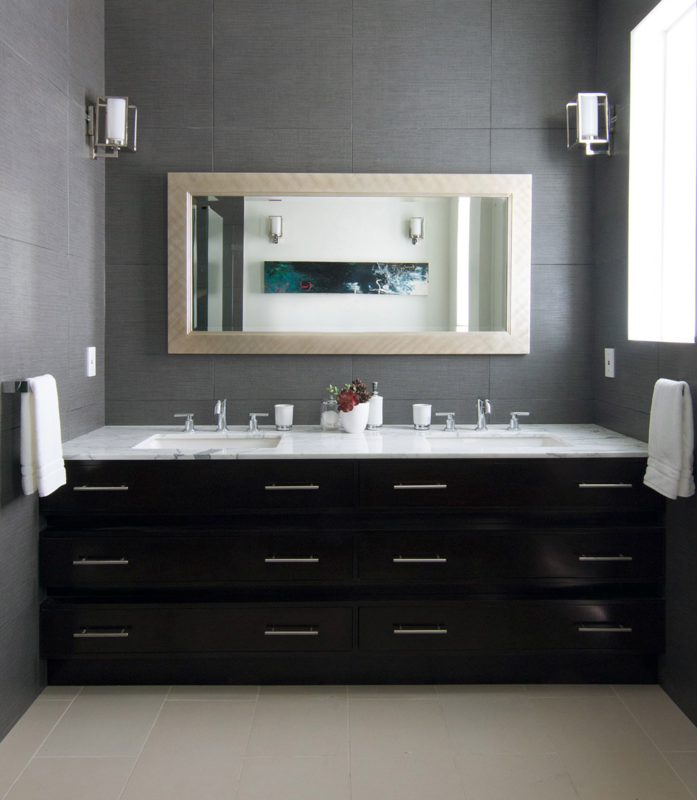 There is nothing worse than buying the wrong amount of materials or too large a vanity that won’t fit into a room. Toilets There should be at least 16 inches from the center of the toilet to a wall or fixture on either side. Toilet compartments should be at least 36 inches wide by 66 inches deep. Doorways should be at 32+ inches wide. Sinks – There should be 15+ inches from the center of a sink center to the nearest wall. 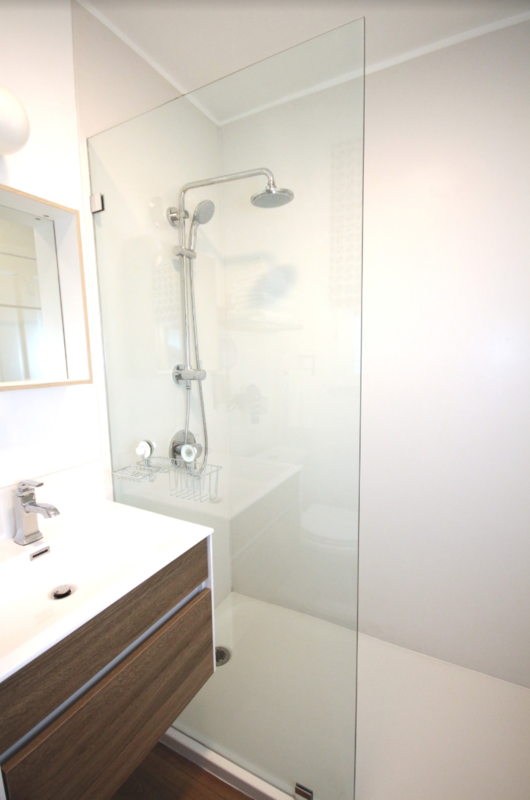 Shower – Showers are at least 34 by 34 inches but bigger is definitely better. Tub/Shower Temperature Controls – Faucets should be mounted 30-33 inches above the floor. If you’re just planning for a shower, consider placing a bit higher. Perhaps around 38 – 48 inches so they’re easier to use while standing. Install shower heads 69 to 72 inches from the floor. Consider doorway clearances and define pathways to move around the space with ease. Consider privacy in the placement of the shower or toilet in relation to windows – This may help you determine if you need window treatments and what kind. 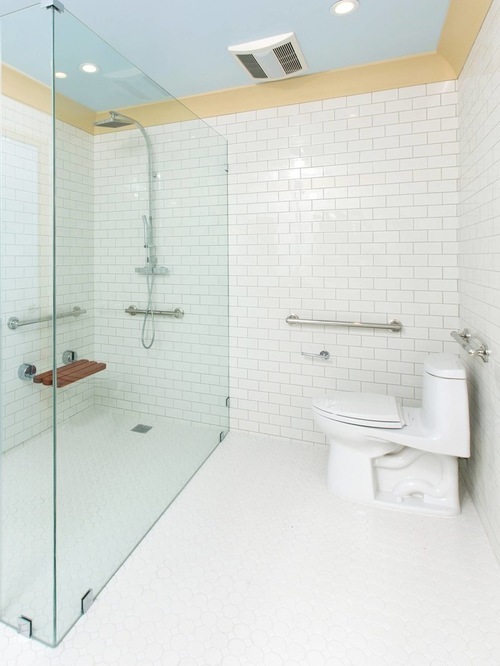 Consider the placement of shower and bath controls and be sure they’re easily reachable and ergonomic. Match tones as much as possible – monochromatic spaces are going to look more expansive. So you’ll want to keep the walls and ceiling the same color and blend tile colors with them as well. Then use lighting fixtures or hardware for your contrast. The mirror and lighting are really going to be your friends here — A full-wall mirror to bounce as much light around as possible will help make the space appear larger, as will the addition of a skylight. As much natural light as possible is the way to go! We want to again take a moment to emphasize the importance of measuring before you buy. There is nothing worse than purchasing an oversized item that won’t fit through a doorway. Of course, working with a designer or builder will help alleviate these kinds of mistakes but they still get made all the time. 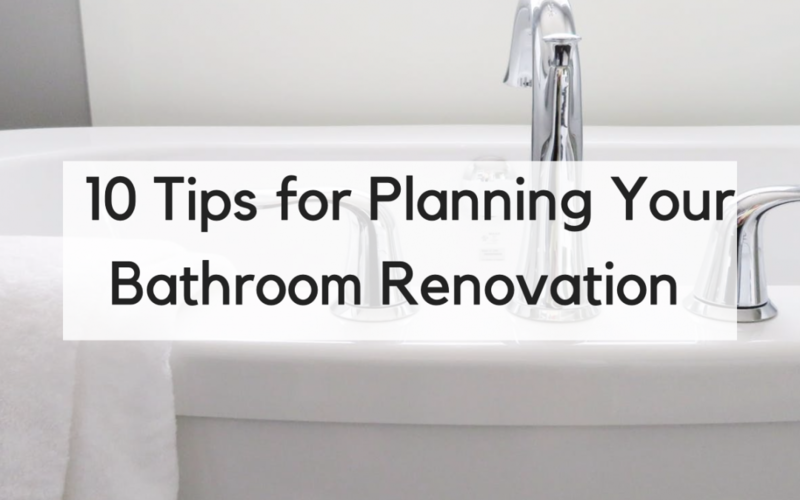 When shopping for a toilet, you want to consider water usage and style and shop for longevity. Look for low-flow models that use about 1.5 gallons/flush. While this has been industry standard for a while, the design and technology used to make low-flow models has come a long way! Lighting plays a major key in room design in both setting the mood, how the room functions, and lighting is also incredibly sculptural. Lighting in the bath is all about lighting in layers! You have your ambient (general, overhead lighting) your task (vanity) and accent/decorative lighting (illuminates small or dark spaces). 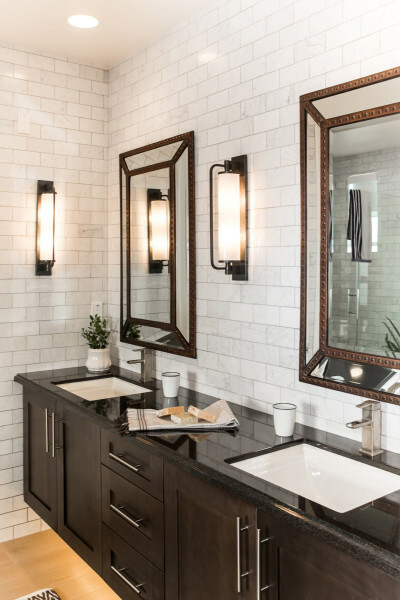 Designer Lori Dennis just published an extensive blog post about all the bathroom lighting tips you need to know, which you can read here. 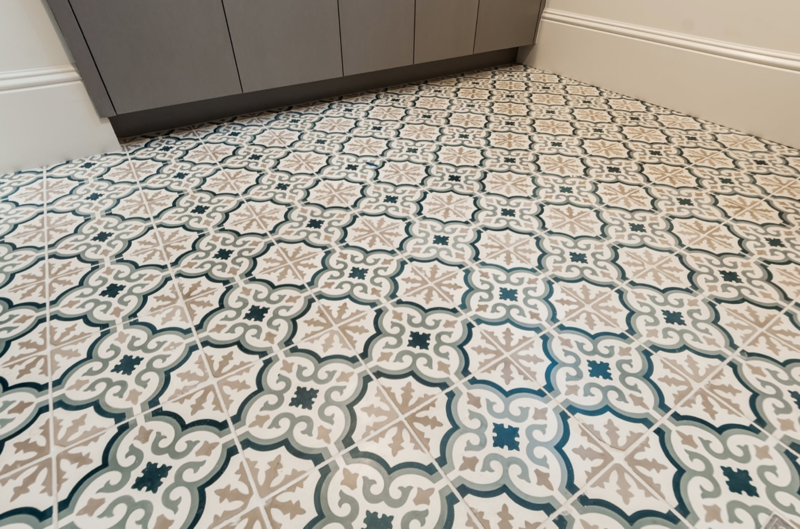 Lately, we’re loving ceramic tile to really make a statement, especially bold Moroccan patterns. We also love the trend that’s emerged of continuing the same hardwood flooring through the entire home: engineered veneer wood flooring has come a long way and mimics the look and style of hardwood without the worry of warping.